Madison Keys says her US Open final defeat to Sloane Stephens feels like it was "12 years ago" but just nine months later the close friends are set for another major battle. Stephens eased to a straight-sets victory over her fellow American in their first grand slam final on home soil last September. All the hype was over Serena Williams' major comeback at Roland Garros, but it is two of the 23-time grand slam champion's compatriots who will take centre stage on Thursday. The duo had never been beyond the fourth round in Paris before last week, but they will meet in the semi-finals on the famous red clay. Stephens was sidelined with a foot injury this time last year and Keys was also out following surgery on her wrist - what a difference a year makes. Keys said the heartbreak of her defeat at Flushing Meadows did not last long as she prepares for another showdown with her best buddy. "Honestly, the Open feels like it was 12 years ago at this point," the 13th seed said. Stephens will have no problem setting about trying to inflict more misery on Keys as she eyes a second grand slam title. 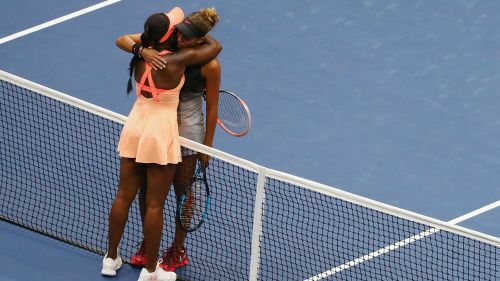 "When we get on the court, it's time to compete but before that, we are not going to be weird and awkward and make it weird for each other," Stephens said after her quarter-final defeat of Daria Kasatkina. "Now I just have to go find her, because I need to tell her some juicy stuff. I just went and searched for her in the training room. Yeah, I think everything will be normal. And then when we get on the court, it's time to compete. It's go time. Until then, we're the same girls as always." They certainly know how to test their friendship.